One of three sessions in the PLL Summit Technology/Tech Services concurrent sessions track. These are notes are from talk by Joelle Coachman, E-Resources Librarian at McKenna Long & Aldridge LLP and owner of Info-2Go Legal Research Services, on integrating new technology into your library. Note: these are my notes from this session; any inaccuracies or omissions are my own. Joelle Coachman gave a lively talk comparing the law librarian profession and law firms with Star Trek. Note that different generations relate to different generations of Star Trek. 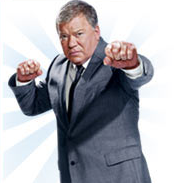 Summer associates see William Shatner as the "Priceline Negotiator", not Captain James T. Kirk. As librarians we are "Data", the data gatherers. Focus is on the vertical engagement, delivery of information up to those we report to. She encourages us to work more in the horizontal, which is more challenging. Social media is the "bad guy" in the room - you might miss key information if you are not searching in social media. Most of us see it as a research tool rather than an engagement tool. Most of us are private and do not want to share. It is the "monster" in the room; we don't view it favorably. The Borg - a lot like a social network - they have no thoughts of their own once assimilated. "Resistance is futile". It creates connection between people; be careful it does not become a negative for you. The way vendors are using data that is being collected. How can we take a Borg-like existence in social networks to instead becoming more engaging and in control? The information proliferated in social networks "is huge" and were "giving it all she's got, Captain". 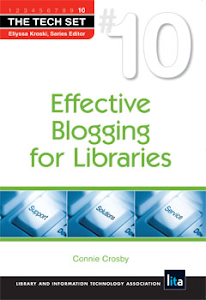 If you are following blogs, you have to make it a daily habit. Make your social engagement, whatever avenue you choose, part of your daily habit. Twitter is valuable, breaks news. But the trouble with Twitter is that it is prolific - too many tweets are not valuable. Engagement is different than anything else we have done as law librarians. She has been following others for a long time, but has only recently started talking with others on Twitter. When you first set up your Twitter account, watch it for a while. It takes a while to fine-tune it specifically. You don't have to follow the world; it is your private domain; follow who you want. When you first start, know who you are following. If tweeting, keep in mind you cannot speak on behalf of your law firm. Keep in mind you are doing both personal and professional mixed together. Know your purpose and know what you want to say. She personally tweets about library and personal topics "all mixed together." People often take key phrases from speakers and tweet them, and then have "little spurts" of discussions. Mark those tweets with tags. You need to know the language of the interest group you are speaking to. Use hashtags to connect with those and other interest groups. So often we keep what we do in the back as "housekeeping" but if you share with the larger world, they will gain respect for what we do. This is horizontal engagement. Cultivate and share who you are. It gives you the opportunity to be individualistic. Earn the right to tweet the link. Organize your social house. She recommends using a third party dashboard such as Hootsuite to allow for following different channels of discussion from the broader community. Otherwise you have to actively build habits to go search certain hashtags. TweetCaster, Tweetdeck and others are available. Mobile devices help. If you are not mobile, you will have to work that into your engagement. You don't have to text message, but if you can get a device that allows you to follow conversations, it will help you be connected and be relevant in a fast-paced environment. LinkedIn - 2 billion people are using it; possibly 500 million are engaged day to day; it is growing and there is a definite change in the way people are using it. Use it for external sharing - how many people shared that you are going to be at this event today? Don't just share with your peers, but share with others you are connected with to show you are active professionally. There is nothing wrong with asserting ourselves and talking about ourselves. Maintain an updated profile - it is like keeping your resume up to date, but easier since they facilitate addition of information in a standard format. You never know what opportunities will come to you. Join or create groups; there is not harm, you can un-join if you do not like it. Get into a habit to go to the group every day or set up email notifications to send to you every day. By working with LinkedIn, it will help you answer questions about it later. Strategic linking: use the "share" button - share to LinkedIn articles you are reading. You never know who in your network will find it interesting as well. Don't hesitate to ask for recommendations. Lawyers cannot always have recommendations because of bar association rules, but law librarians don't have these rules. Even if your firm doesn't post your bio, you should have a bio on LinkedIn. It gives her the opportunity to reach those who would not have found her through her firm. When you are sharing articles and links, send via LinkedIn, even to people internally. She found over time that people in her firm started to re-share links around to their followers. "Make it so!" We can sit in the Captain's chair and drive the ship where we want it, contribute to the enterprise with "happy eyes" rather than fear and trepidation. She was also asked about use of Facebook. She uses Facebook personally but not as much professionally. The training she does now has forked toward LinkedIn. She encourages law firm librarians to make it personal rather than professional. If businesses want to be found, they have to be there, but think about your focus. If you are not using LinkedIn as a professional, you need to question why. It is where the professionals are.